Home » About » History » Who was St Chad? 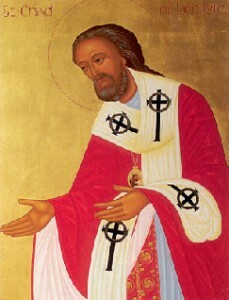 St Chad was the first bishop of Mercia and Lindsey at Lichfield. He was the brother of Cedd, whom he succeeded as Abbot of Lastingham, North Yorkshire, and a disciple of Aidan who sent him to Ireland as part of his education. Chad was chosen by Oswi, king of Northumbria, as bishop of the Northumbrian see, while Wilfrid, who had been chosen for Deira by the sub-king Alcfrith, was absent in Gaul seeking consecration shortly after the Synod of Whitby (663/4). Faced with a dearth of bishops in England, Chad was unwise enough to be consecrated by the simoniacal Wine of Dorchester, assisted by two dubious British bishops. Wilfrid on his return to England in 666, found that Alcfrith was dead or exiled and retired to Ripon, leaving Chad in occupation. But in 669 Theodore, Archbishop of Canterbury, restored Wilfrid to York and deposed Chad (who retired to Lastingham), but soon reconsecrated him to be bishop of the Mercians. This unusual step was due both to the new opening for Christianity in Mercia and to the excellent character of Chad himself, whom both Eddius and Bede recognised as being unusually humble, devout, zealous and apostolic. Chad’s episcopate of three years laid the foundations of the see of Lichfield according to the decrees of Theodore’s council at Hertford, which established diocesan organisation. Wulfhere, king of Mercia, gave him fifty hides of land for a monastery at Barow (Lincolnshire); he also established a monastery close to Lichfield Cathedral. Chad died on March 2nd 672 and was buried in the Church of St Mary. At once, according to Bede, he was venerated as a saint and his relics were translated to the Cathedral Church of St Peter. Cures were claimed in both churches. Bede described his first shrine as ‘a wooden coffin in the shape of a little house with an aperture in the side through which the devout can…take out some of the dust, which they put into water and give to sick cattle or men to drink, upon which they are presently eased of their infirmity and restored to health’. His relics were translated in 1148 and moved to the Lady Chapel in 1296. An even more splendid shrine was built by Robert Stretton, bishop of Lichfield (1360-85) of marble substructure with feretory adorned with gold and precious stones. Rowland Lee, bishop of Lichfield (1534-43), pleaded with Henry VIII to spare the shrine: this was done, but only for a time. At some unknown date the head and some other bones had been separated from the main shrine. Some of these, it was claimed, were preserved by recusants, and four large bones, believed to be Chad’s are in the Roman Catholic cathedral of Birmingham. A fine Mercian illuminated Gospel Book of the 8th century called the Gospels of St Chad was probably associated with his shrine, as the Lindisfarne Gospels were associated with the shrine of St Cuthbert; it is now in Lichfield Cathedral Library. The 11th century shrine list mentions the relics of Cedd and Hedda resting at Lichfield with Chad. Thirty-three ancient churches and several wells were dedicated to St Chad, mainly in the Midlands. There are also several modern dedications.